FIRST of all, let me say I am not here – AT ALL – for any kind of defense or sympathy or ANYTHING for Trump, or his voters for that matter. 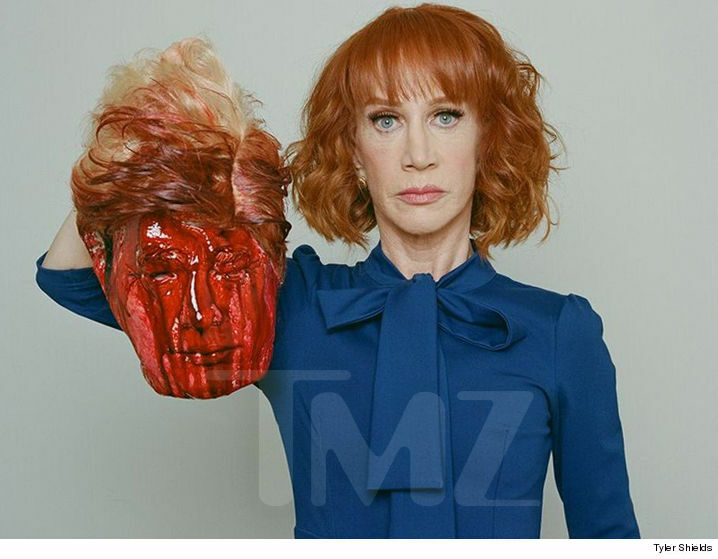 Kathy Griffin wants Donald Trump‘s head … but she wants it bloody and detached from his body. The comedian posed for the gory shot during a photo session with famed photog Tyler Shields, who’s known for edgy, shocking pics. We got the pic before the release. During the photo shoot, Kathy joked that she and Tyler would need to move to Mexico once the pics got released, for fear they’d be thrown in prison. Trump’s critics have skewered him for inciting violence with his speech. Did Kathy do the same? I don’t know, guys. This is a bit much for me. Trust me – not out of a desire to “respect” Trump’s hateful azz….but I mean…. From where my mind is right now – THIS is A LOT. Sooooo Kathy has issued an apology? Ummmm. Okay. Like…. you would think the reaction would be expected, no? Yikes. A 3D Printed House for $10,000? I’LL TAKE IT! I saw one of the coolest things today! I need this to come to the United States IMMEDIATELY! THIS is the future, guys! Nikita Chen-yun-tai, the inventor of the mobile printer and founder of Apis Cor, explained his desire is “to automate everything”. Do you know how many lives this would change? I absolutely love it! For now the technology is in its infancy, however in a few years, the deflationary pressures unleashed by Apis-Cor and its competitors could results in a huge deflationary wave across the construction space, and would mean that a house that recently cost in the hundreds of thousands, or millions, could be built for a fraction of the cost, providing cheap, accessible housing to millions, perhaps in the process revolutionizing and upending the multi trillion-dollar mortgage business that is the bedrock of the US banking industry. What do y’all think? Would you live in a 3D printed house?